I recently watched the Great Gatsby film and fell in love with the outfits. 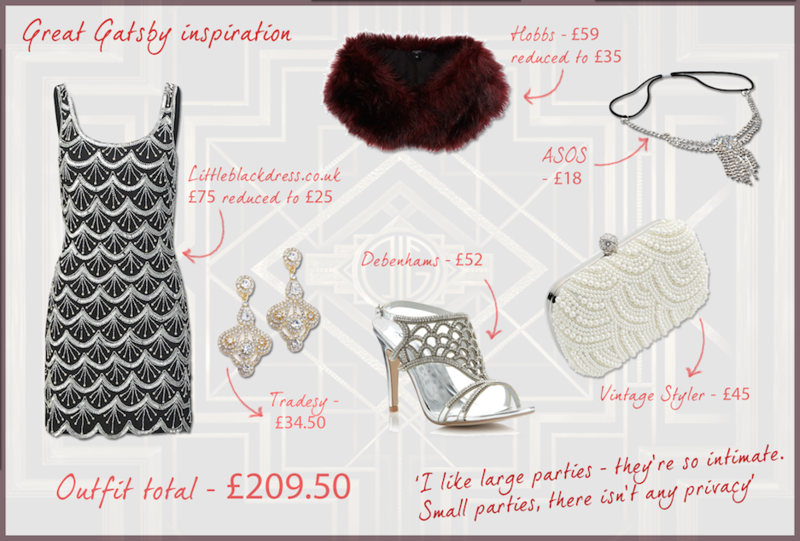 The art deco patterns on 20’s flapper dresses were fantastic and so heavily detailed giving a real feeling of luxury. Here is an outfit I have put together giving a nod to the Great Gatsby wardrobe with a modern tone aiming for a classy and extravagant style. The look is the same as the film bold, bright and beautiful. The colour palette needed for a Great Gatsby look uses nudes and blush shades and pale colours with metallic elements and is very easy to recreate. Miuccia Prada collaborated with Baz Luhrmann and costume designer Catherine Martin to create the costumes for the film. You can see the beautiful designs and read more on the collaboration at Vogue.